Rescuers have advised journalists and bystanders to leave Amatrice urgently, as "the town is crumbling", the BBC's Jenny Hill says. New cracks appeared in the town's hospital after strong aftershocks. Some tremors after the quake were felt as far away as Rome. "We are sleeping in the car and there were shocks all night. When the biggest one came, the car started moving and shaking," said Monica, a survivor from Amatrice. The latest death toll was given on Thursday morning - 190 deaths in Rieti province and 57 in neighbouring Ascoli Piceno province. Many of those affected were Italians on holiday in the region. Some were in Amatrice for a festival to celebrate a famous local speciality - amatriciana bacon and tomato sauce. 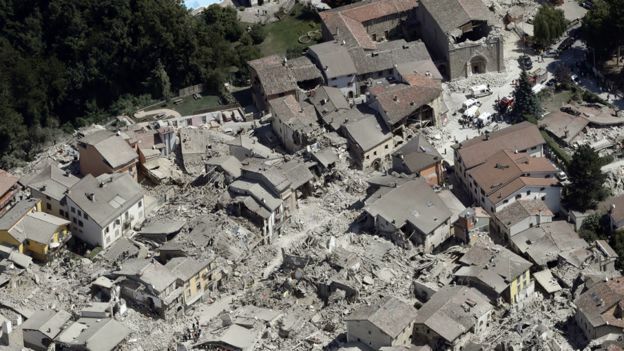 The quake struck small towns and villages in the mountainous area where the regions of Umbria, Lazio and Le Marche meet. Among the victims was an 18-month-old toddler, Marisol Piermarini, whose mother Martina Turco survived the deadly 2009 earthquake in L'Aquila and moved away from there after the experience, Italian news agency Ansa reported.